If you’re interested in a luxury mattress, both Aireloom and Simmons Beautyrest are two companies that promise luxury, innovation, and extreme comfort. While Beautyrest highlights its advanced sleep technology, Aireloom puts an emphasis on personal, handmade precision. They each offer hybrid mattresses that utilize coil technology with high-quality foams. Moreover, both brands are definitely on the higher end of the pricing spectrum. While they utilize luxurious and top-of-market materials, you’re going to pay for it. Before we give it all away, keep on reading to have all the details broken down to learn which mattress might better suit your needs, style, and budget. Aireloom is a California brand owned by E.S. Kluft & Company that exclusively makes and distributes mattress in retail stores around the United States. Since its founding, Aireloom has been in the bedrooms of celebrities, the upper class, and even inside the White House. Once called “The Rolls Royce of Mattresses,” Aireloom is a luxury mattress company that handmakes every mattress and utilizes top-quality foams, coils, and fabrics. 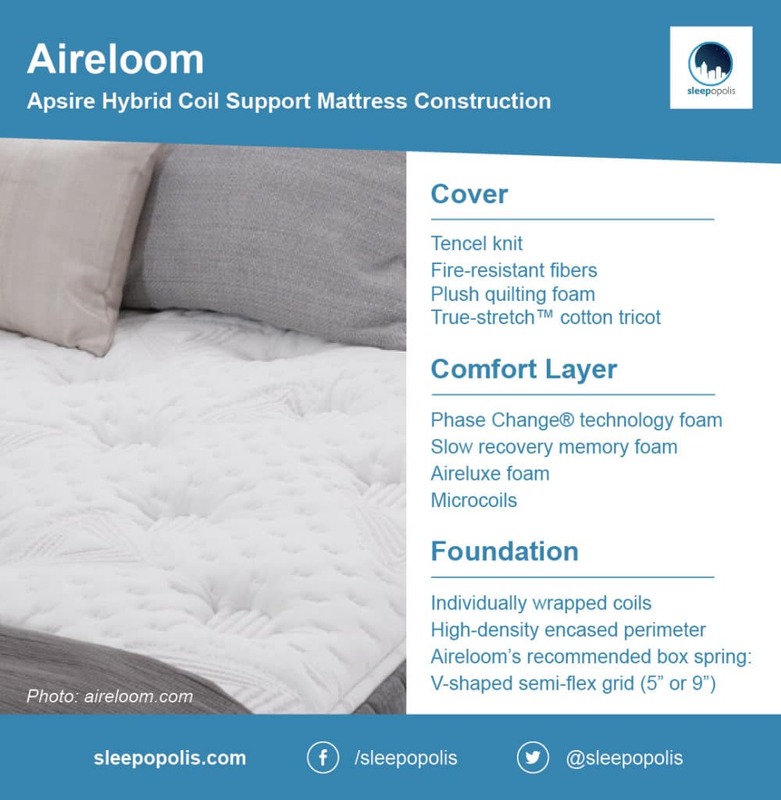 There are five different mattress collections within Aireloom, and each collection typically comes in firm, medium-firm, and plush comfort levels. In total, Aireloom currently offers 27 different mattresses. For this review, we’re going to be looking at Aireloom’s Aspire Hybrid Coil Support collection, which has two comfort levels to choose from: plush and firm. The fabric and quilt of this bed are made with a Tencel knit that is designed to conform to your body’s shapes and curves. Underneath are fire-resistant fibers, a plush quilting foam, and a True-stretch™ cotton tricot for softness and support. Since this series comes with two different mattresses — plush and firm — the thickness in comfort level will vary depending on if you want something soft and plush (thicker layers) or something more firm (thinner layers). The main feature in this comfort layer is Aireloom’s temperature regulating foam that uses Phase Change® technology to keep sleepers cool. Underneath this foam is a slow recovery memory foam, along with a thick layer of Aireluxe foam. The bottom layer consists of micro coils, which are made from thin and flexible steel coils that aim to provide additional pressure relief and durability. The coil count is 1,386 for a Queen and 2,400 for a King. The foundation of this bed is a layer of individually wrapped coils, which move independently and are encased in separate pockets to better contour to the body and provide deep and comforting pressure relief. These come in a 15-gauge for the plush version and a 13 ¾ gauge for the firm mattress. The full perimeter coil count is 830 for a Queen and 992 for a King. The foundation also includes a high-density encased perimeter for edge support. Aireloom recommends using its box spring, though you don’t need to. If you choose to purchase the box spring that is built for this mattress, it is a V-shaped semi-flex grid held in place with an interlocking grid work. It’s available in 9” height for something a bit taller or a 5” profile if you want to be lower to the ground. What’s nice about the Aspire Hybrid mattress is you can choose the plush or firm mattress depending on your preferences. The glass-half-empty version is that many other Aireloom collections offer a “luxury-firm” (medium-firm) feel, so if you want something not too hard or soft, you might be better off with a different Aireloom collection. For both the plush and firm versions of the Aspire Hybrid mattress, the individually wrapped coils will provide a consistent distribution of support and do a great job at isolating motion. This is especially great if you sleep with a partner and don’t want to be disturbed if he or she is moving around at night. The firm version will use higher gauge pre-compressed pocket coils for more “tightness,” and a thicker lower gauge coil in the plush version for some extra release. For the Aspire Hybrid Coil Support Firm, your bed will have a thinner comfort layer and higher gauge pocket coils, providing a sturdier feel. If you choose the Aspire Hybrid Coil Support Plush, your mattress will most likely feel sturdy, yet super soft, with a healthy amount of bounce and good motion control. The Aspire Hybrid is also known for its edge support, thanks to the high-density encased perimeter that’s part of the foundation. You might also feel like you’re being cradled and “lifted,” with Aireloom’s patented technology that claims to provide a feeling of weightless and make you truly feel like you’re sleeping “on top” of the mattress versus sinking into it. Lastly, this bed will feel soft. These mattresses are built with Tencel® New Age fabric in the quilt, which is a sustainable fabric regenerated from wood cellulose, similar in feel to rayon and bamboo. In addition to feeling super soft, Tencel is one of the most environmentally friendly regenerated fabrics, making this an eco-friendly choice. Exact prices are not available online for Aireloom mattresses. The only clues we do have is this mattress collection was inspired by the original Aspire Collection, which shows mattresses in a $1300-$2099 price range. If you’ve heard of the well-known brand Simmons, then you most likely are familiar with Beautyrest Black — whether you know it or not. Beautyrest Black is a collection within Simmons that offers hybrid mattresses geared towards luxury and innovative design. A combination of balanced foams and pocketed coils, the Beautyrest Black is a supportive mattress ideal for a wide range of sleepers. 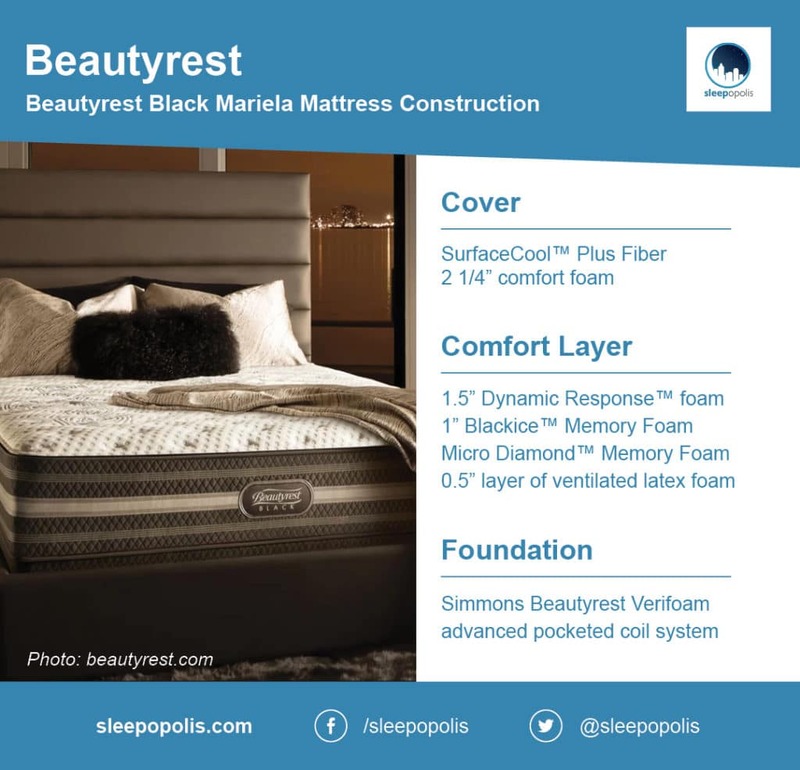 The cover of the Mariela uses Beautyrest’s trademarked SurfaceCool™ Plus Fiber, a fiber right beneath the cover that’s designed to move heat away from the surface of the mattress to help maintain a comfortable and cool sleeping temperature. Underneath this fiber is 2 1/4 inches of comfort foam. 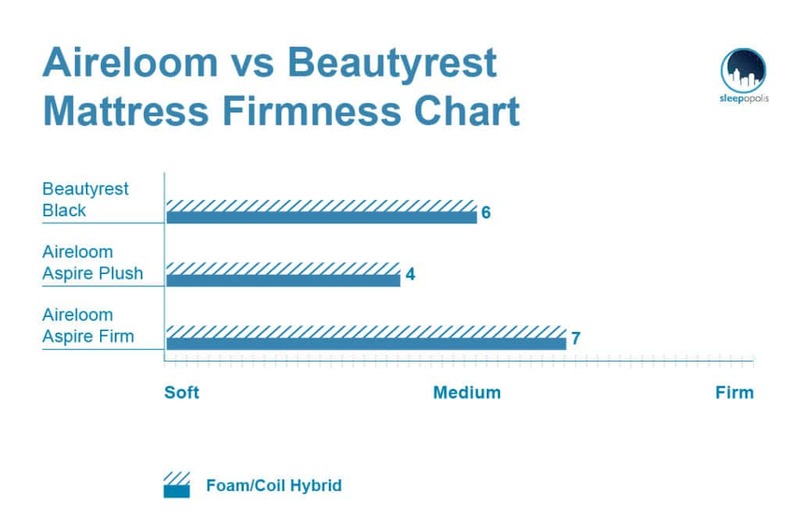 For the comfort layer, Beautyrest offers three different types of foam. First is 1 1/2 inches of Dynamic Response™ memory foam, which is ventilated to allow for airflow while providing conforming support specifically for the back. Then comes 1″ of Blackice™ Memory Foam, a breathable gel technology applied to Beautyrest’s Micro Diamond™ Memory Foam which is designed to keep you cool. Lastly is a 1/2 inch layer of ventilated latex foam that aims to provide ample pressure relief. 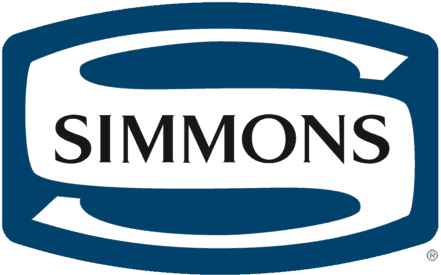 The “support layer,” which you could think of as being the foundation, is a layer of individually wrapped coils, which is formally called “Simmons Beautyrest Verifoam advanced pocketed coil system.” These coils are “triple stranded,” which provide greater durability than traditionally wrapped coils and focus on delivering pressure relief, isolating motion, and providing ample back support. The coil count in 850, a little less than the Aireloom. The Simmons Beautyrest Black Mariela Luxury Firm mattress comes in at a 6 out of 10 on the firmness scale, meaning it’ll provide a pretty true “medium-firm” feel. Similar to the Aireloom, this luxury hybrid mattress is constructed with a handful of different foams and an intricate innerspring system. The coil-on-coil construction provides durability, support, and comfort. The thick layers of various foams (gel foam, latex foam, and memory foam) on top means you’ll have a super plush top layer above the triple-stranded pocket coil system. With the foam layers on top of the coils, energy is transferred into the foams before the coils, reducing movement throughout the mattress. In other words, the mattress will do a good job at isolating motion, just like the Aireloom. Similar to Aireloom, this mattress does a good job at keeping cool. Between the airflow that occurs through the coils, and the use of ventilated foams, you’ll most likely not have to deal with heat getting trapped inside your bed. Overall, the layering of foam and springs means the Beautyrest Black will provide a moderate amount of sinkage, strong support, and good body contouring and cradling. Price may vary depending on the retailer. Make sure to talk to a store rep to find out the exact price before swiping that credit card! Compatible with Beautyrest’s SmartMotion base. 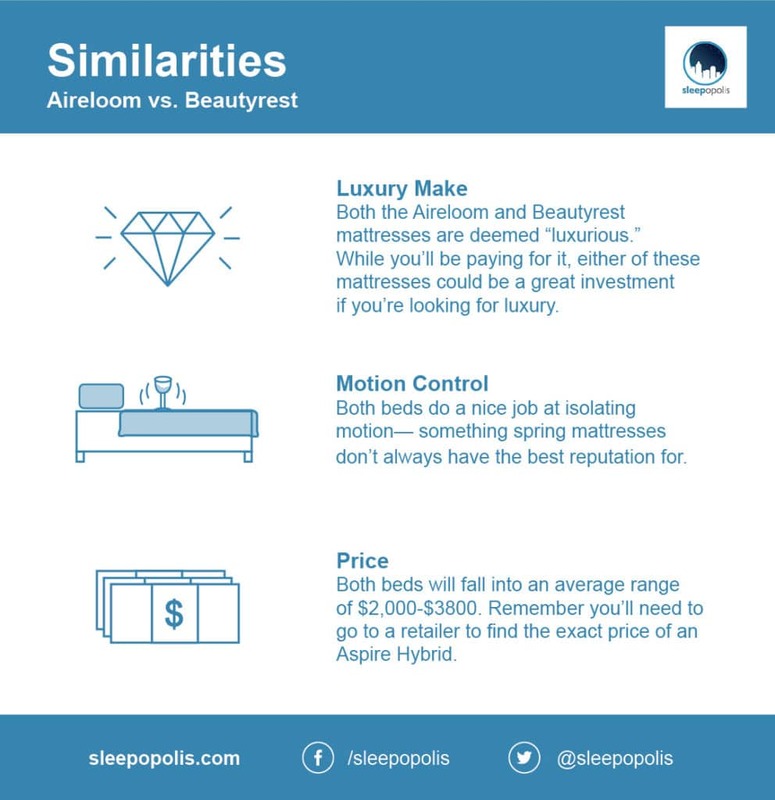 Luxury-make: Both the Aireloom and Beautyrest mattresses are deemed “luxurious.” They focus on providing high-quality materials, in-depth construction, and top-notch comfort. While you’ll be paying for it, either of these mattresses could be a great investment if you’re looking for luxury. Motion control: Both beds do a nice job at isolating motion — something spring mattresses don’t always have the best reputation for. However, the nice layer of foam on top, along with the coil gauge system, helps prevent motion from moving through the bed. Price: Both beds will fall into an average range of $2,000-$3800. Remember you’ll need to go to a retailer to find the exact price of an Aspire Hybrid. Coil system: The Aireloom has a layer of micro coils in its comfort layer, which is right above the layer of individually wrapped coils. The only slight difference here is the Beautyrest has a layer of triple-stranded pocket coils. Comfort level: The Aspire Hybrid has two levels of comfort: plush and firm. There is no medium-firm option. On the flip side, this Beautyrest mattress only comes in a medium-firm (aka luxury firm) feel. Use of foams: Both mattresses have foam in its comfort layer, yet the Beautyrest mattress has quite a bit more layers of foam. This will give a different feel — one that contours the body while providing a bit more sinkage. All in all, if you’re looking for a luxury hybrid mattress, both of these mattresses are great options. They have similar coil counts, isolate motion, and keep cool. 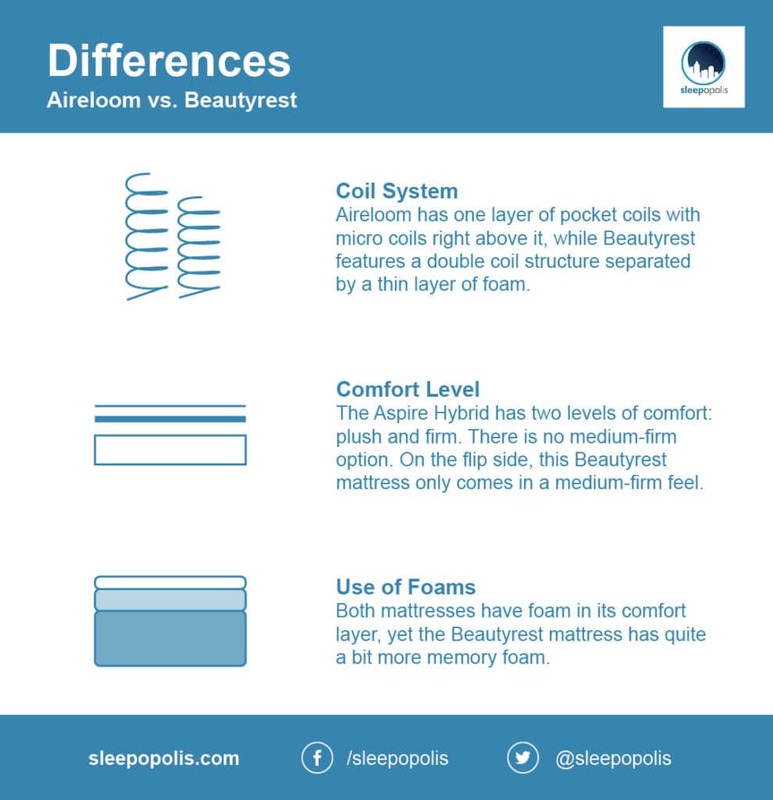 However, the Beautyrest puts an emphasis on memory foam and comes in a medium-firm feel, whereas the Aireloom includes more balance when it comes to foams, and is offered in plush or firm. Hopefully, this means that depending on your exact preferences, you can pick the mattress perfect for you, whether that’s Aireloom or Beautyrest.